From the classroom to the clinical laboratory to community, faculty at the University of Miami School of Nursing and Health Studies are committed to quality education, research, and outreach programs that improve patient care through evidence-based practice. Our faculty rank among the leading scholars and experts in their field. Renowned for their clinical excellence and scientific expertise, faculty hold advanced degrees not only in nursing but also in public health, psychology, medicine, nutrition, education, and administration. 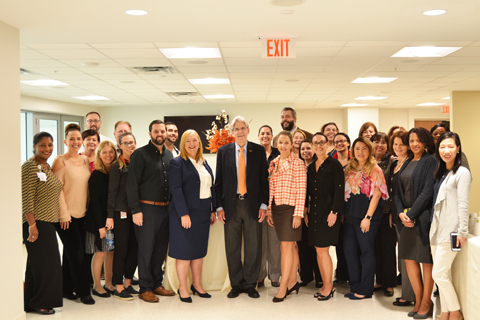 Over half of the school's faculty hold joint appointments or are engaged in collaborative, federally funded research with other schools and colleges at the University of Miami, including the Leonard M. Miller School of Medicine. As a result, our students receive a comprehensive, clinically current education with direct exposure to leading edge research and innovative, community-based care. Please see the Faculty Directory, Staff Directory, and Faculty Openings for more information.